Google love being on the news and they love dominating the internet. Despite that ?there is one area which they have lagged behind, social network. Google buzz is a brilliant idea which might be a big hit with people. 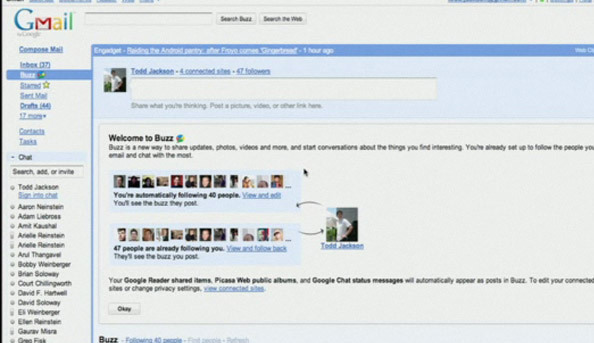 Google buzz is integrated in the Gmail, meaning one will not need to migrate to a new ?interface. ?The functions of the Google Buzz is already common knowledge for many so there is no need for a huge volume of tutorial as was the case with Google Wave. Sometime back I wrote a blog post wondering whether Google wave was hyped for nothing. Well, with introduction of Google buzz , Google is now officially confirming that the idea of Google wave did not work. Is this the death of Google Wave? ?I think so, after bringing the excitement to Gmail, they don?t expect people to fall over their feet for Google wave. What does this entails for the other dominant social network sites like Facebook and Twitter? ?On the face of it ?Google is targeting Facebook and Twitter but I doubt if people will just abandon the existing social networking sites to go for Google buzz. No doubt this ?will definitely makes Gmail fun and many people might signup for the Gmail accounts but It is not unique to find people who maintain multiple social networking sites. Yours truly for example have very active Facbook page, Twiiter account, linkedin page as well as Iborian and whive accounts. Probably one would wonder how I do that, well, social networks activities are based on sharing on small bits, status updates to be precise and tweeting. How long does it take to? compose 140 character long sentence? A matter of seconds I guess. So how Buzz described or explained, Buzz is a stream of status updates, pictures, links, and videos from your friends. You can ?like? these items and you can comment on them. Google also took the aspect of Twitter hashtag @ when referring to someone or replying to a friend. ? ?For those who use ?Picasa, Google Reader, or Twitter, you can import ?from? them to your stream. Yeah Buzz will also recommend items you might like based on your friends? activity. How about the aspect of the people you follow being auto-generated for you out of your emails, very cool. ?According to Google video there is nothing to setup, you are using friends you have already made in Gmail. As we know it in Facebook or twitter the art of sharing is to everyone you are connected to.? For the personal communication you can write a message as in Facebook or DM as it is commonly known in twitter.? Buzz bring in an interesting aspect of share publicly or privately. ?You can Publish your ideas to the world or just to your closest friends. Google do not want to leave out the aspect of the mobile phone in the use of Buzz. When using? mobile phone and in particular android or an iphone, ?you will immediately see buzz around you and tag posts with your location. Is it high time they introduce in schools a subject called Internet?